As you know, I have always loved changing my room around! About three years ago, I got a new desk and dresser, which I still have now. 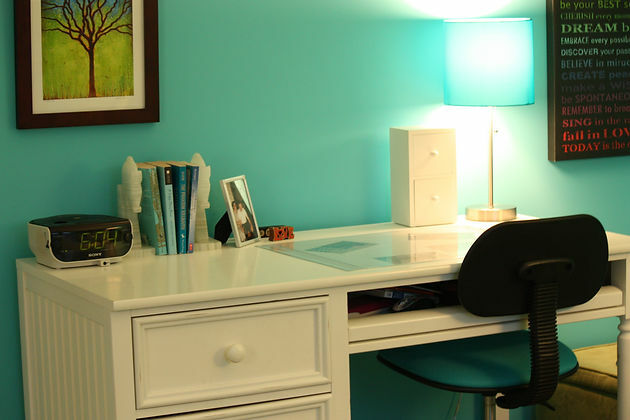 But the redesign really started to take off about two years ago when I repainted my room from green to turquoise. Then came a new bed, a new chair, and new accessories. The final collection of details included a gray tufted headboard, and a custom shelf! Now I am completely happy with my room! Of course, I’m sure that I will make some small changes over the next few years, but that’s okay :) Over the summer, I am going to get some better accessories for my shelf. The ones I have now are very cheap, and they look like it compared to the two handmade expensive ones I have. I am still in love with my shelf though!